Soon after I completed the Lincoln Pier mural in January 2017, I started having ideas for a new mural project. I imagined a long wall painted with densely blooming blue jade vines, a visual narrative of Hawaiian native and introduced species hidden in the flowers and leaves. Time passed and I didn’t paint the Blue Jade mural, but I couldn’t get it out of my mind. Often, images for new artwork arrive complete to my mind, and I don’t always understand my own motivations. The persistence of the Blue Jade concept kept me thinking about why this specific image was so important to me. I realized that my inspiration came from the overwhelmingly lush experience of being embedded in a vast, living environment. The idea expanded from a single public mural, to selecting and exploring ecosystems that place the human perspective within the context of this rich, intricate natural world. Humans typically see eelgrass lying flat on the sand at low tide, or washed up after storms. I imagined this incredible environment becoming slowly weightless with the rising tide, floating up from the ocean floor. The daily shift of changing tides creates a temporary kingdom that research shows is one of the richest and most productive coastal habitats on Earth. The beauty and mystery of these natural cycles of change is an endless source of primal joy and inspiration for me. 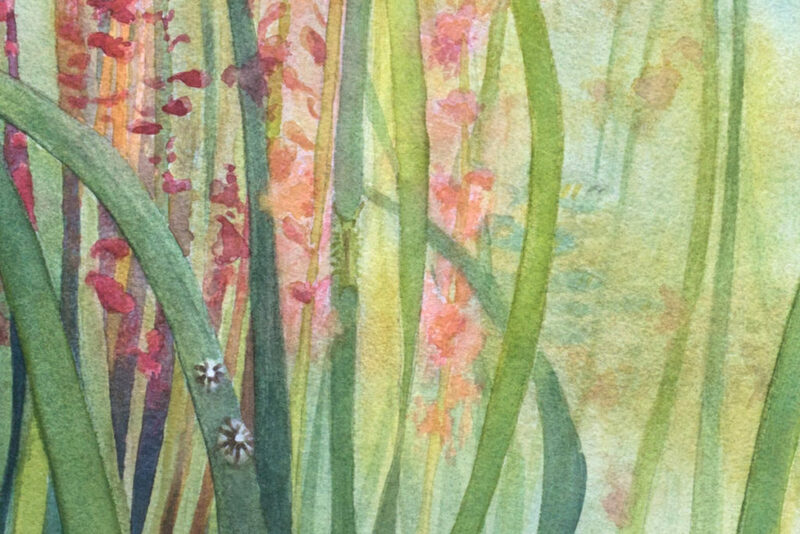 As I began to paint this first image, it became clear that an encompassing network of plant life should provide the main theme for each artwork, rather than a traditional central focal point with a single starring character. These paintings are a visual representation of the shift from an ego-centric to eco-centric viewpoint – a shift that I believe improves our relationships with ourselves, each other, and the world. The decentralized composition also continues to support a mural format, where viewers experience the artwork progressively while walking past. 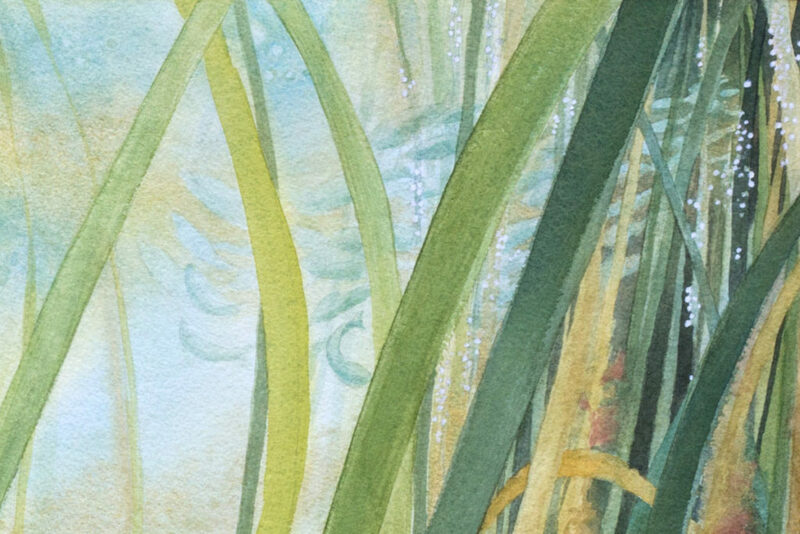 Eelgrass Meadow is mostly watercolor, with a few flowing bands of metallic gold acrylic that sparkle in direct light or at a steep angle. Viewed straight on, under normal room lighting, the metallic paint is nearly invisible. One of my goals for the Lush series is to include subtle, hidden details like this. I also had a great time camouflaging creatures in the eelgrass, trying to ensure that our natural tendency to identify with a “main character” would remain centered on the environment itself. Eelgrass is the most widespread seagrass species in the world, and is abundant at the low tide line along the Pacific Northwest coast. Seagrass has so many benefits for the environment that many articles I read chose to highlight just a few with obvious, direct benefits to humans. Eelgrass meadows help protect shorelines, improve water quality, and support many fish and invertebrate species: providing shelter for young salmon and Dungeness crab, spawning grounds for herring, and food for dozens of species both above and below water. The more I learned about why seagrass is such a crucial habitat, the more I felt that no matter how many facts were presented, true caring always starts with an emotional connection. 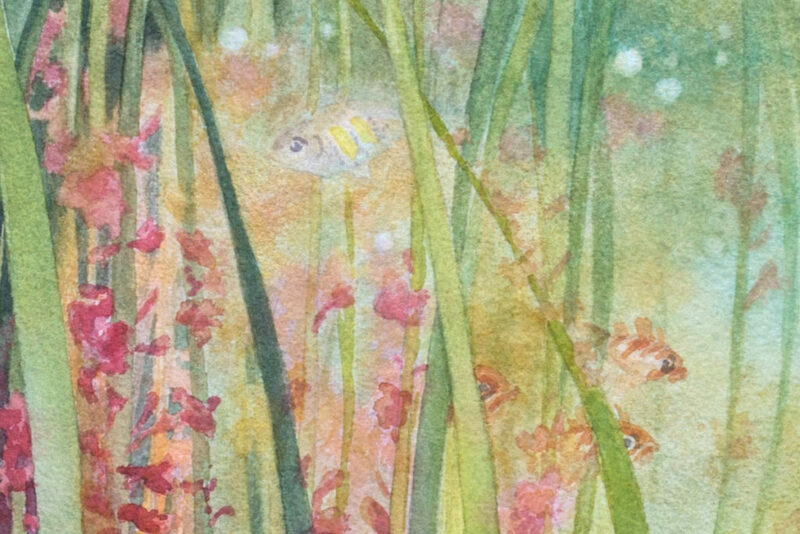 For me, that came from imagining eelgrass meadows from a different perspective: the graceful beauty of the grass blades flowing with the tides, revealing glimpses of the many species hidden in this underwater forest. 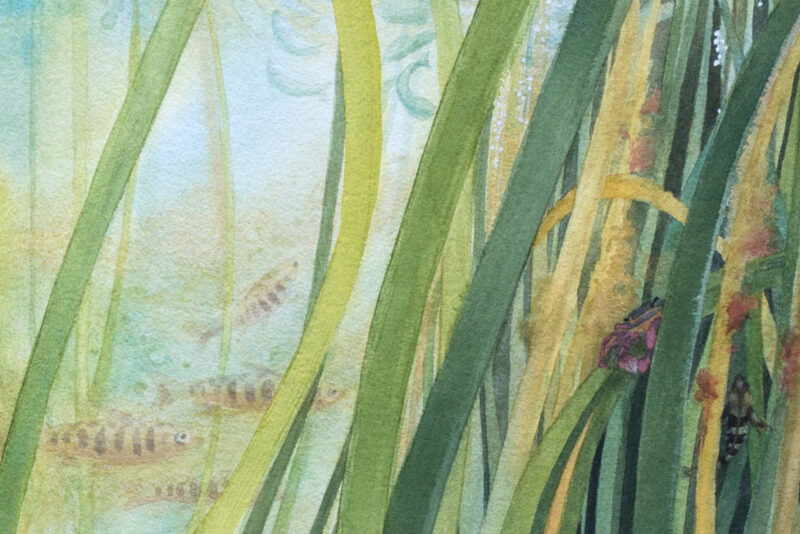 It was difficult to restrain myself from including so many fascinating species in my painting that the eelgrass would be hardly visible. I satisfied myself with the following, starting at the top left and continuing clockwise: shiner perch, copper rockfish, Pacific herring (and eggs), Pacific sculpin, shore crab, eelgrass isopod, and eelgrass limpets. Red fringe and brown algae grow on the blades of the eelgrass, providing food for these species and dozens more. One third of seagrass meadows have already disappeared worldwide, stressed by coastal industry and climate change. Experimental plantings are being established in various regions to improve water quality for nearby habitats, including coral reefs and oyster beds. Project Seagrass is a clear and helpful resource to learn more about the many ways this habitat is important to humans, and what we can do to conserve it. The original painting will be included in 2019’s “Ode to the Tides” group show, traveling to venues around Oregon with sales benefiting the Wetlands Conservancy. The exhibit opens May 2 at Oregon State University. Prints of this painting are available now on my website. 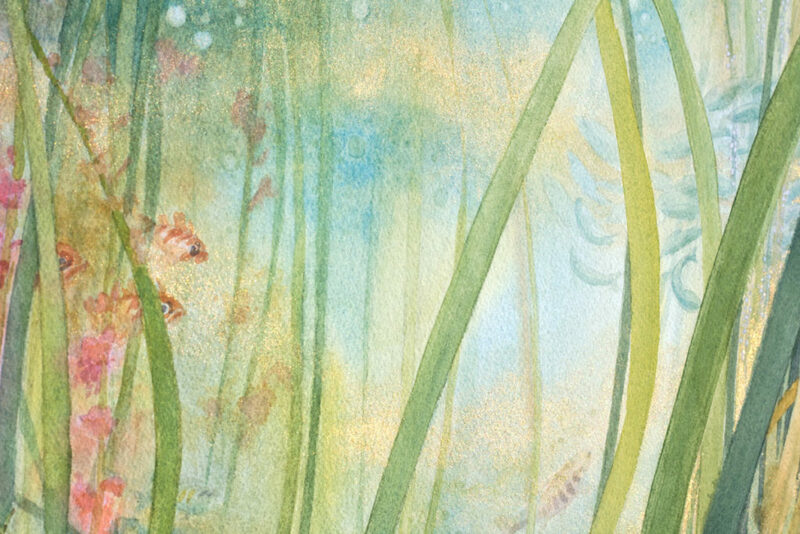 The “Ode to the Tides” exhibit will present scientific programming about Oregon’s estuaries and tidepools along with artwork from 90 local artists. I am so excited to be a part of this exhibit, partnering local ocean conservation with education and outreach through art. I’ll be announcing more details about the exhibit soon!